What happened to Microsoft? Not only has it just busted out some pretty decent tablets, but its execs seem to know how to have fun too. 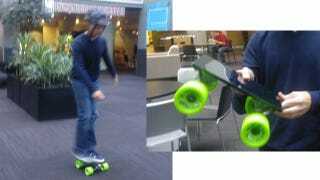 Steven Sinofsky, head of the Windows unit, decided to mount some skate trucks on the back of a Surface tablet and ride that thing around Microsoft's campus.